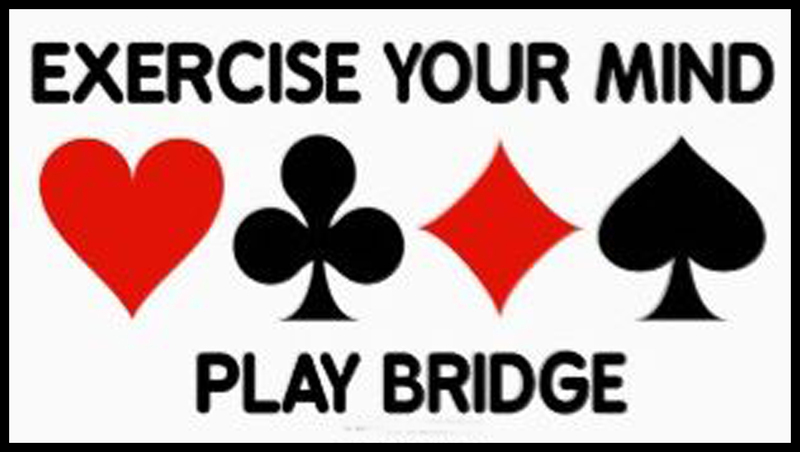 Playing Bridge Sharpens Your Brain! 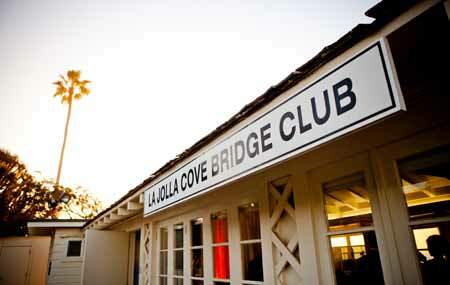 La Jolla Cove Bridge Club is located on beautiful Point La Jolla in the village of La Jolla, California. 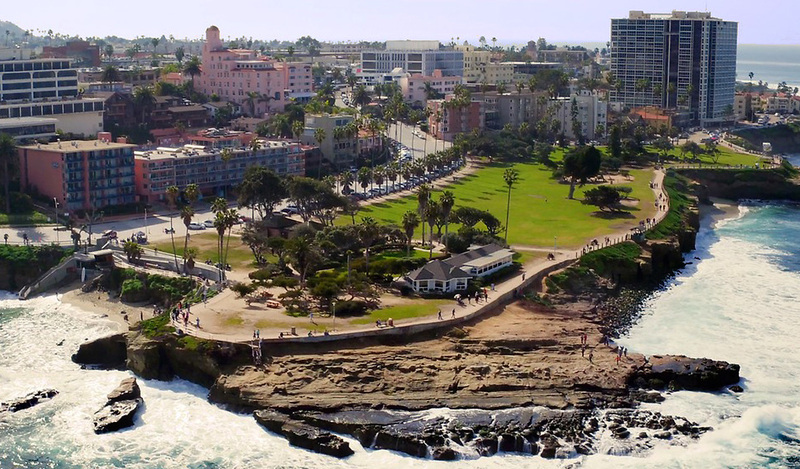 We sit adjacent to Ellen Browning Scripps Park and atop the La Jolla Cove which is San Diego’s most alluring spot for swimming, diving and snorkeling. The panoramic views of the Pacific Ocean here are breathtaking, the sheer variety of abundant marine life is extraordinary and our sunsets are a true wonder to behold. This area has lured visitors from around the world throughout La Jolla History. The Cove, surrounded by cliffs is protected as part of The La Jolla Underwater Park and Ecological Reserve, consisting of several habitats which include rocky reefs, sandy flats, kelp forest and two underwater canyons. The reserve spans 6,000 acres and is sanctuary to diverse species of marine flora and faun including seals, sea lions, dolphins the spotted leopard sharks and even migrating whales. 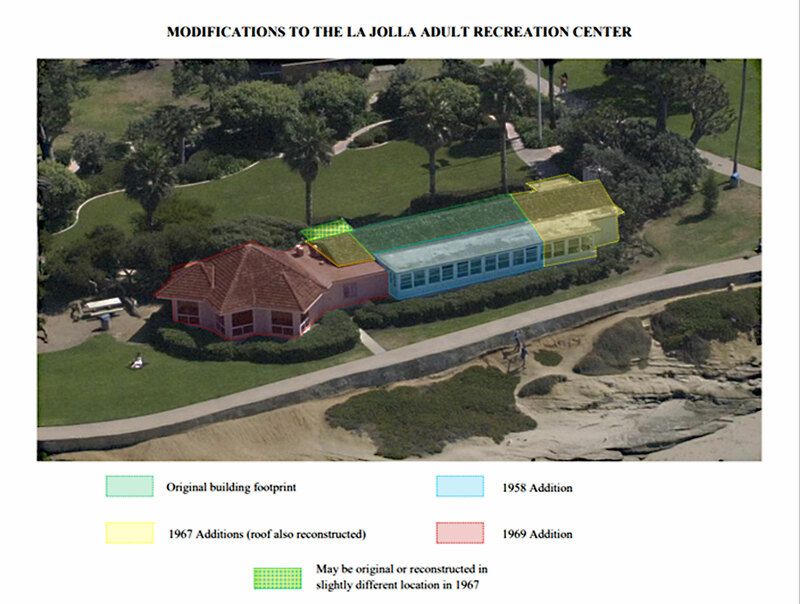 Originally formed as the La Jolla Shuffleboard Club, later, the Adult Recreation Center Club (A.R.C.) then renamed the La Jolla Shuffleboard Club, still later the La Jolla Bridge & Shuffleboard Club and presently the La Jolla Cove Bridge Club. We first came into existence as a means to provide out-of-town visitors, as well as La Jolla inhabitants with recreational enjoyment. Many of the visitors we welcomed, were inspired by our town’s beauty, flavor and charm, felt compelled to purchase homes and thus helped grow our community. 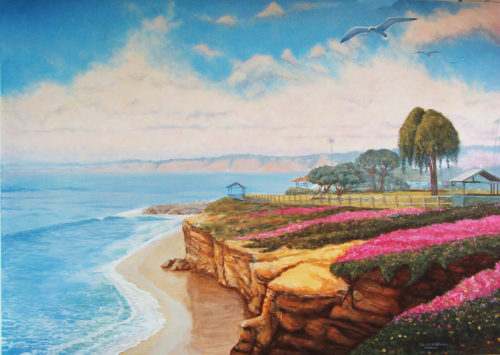 In spite of our changing names, we have remained a consistent place to go for fun and recreation in La Jolla. That tradition continues to this very day as we play host to bridge games and a multitude of weddings, events, classes and other entertaining and useful gatherings. On October 27, 1932, La Jolla’s Chamber of Commerce announced formation of the “La Jolla Shuffle Board Club.” It’s main purpose was to provide a central, outdoor meeting place with “light recreation” for visitors to La Jolla. Resident members would be urged to welcome visitors and ensure that shuffleboard games were available for all. 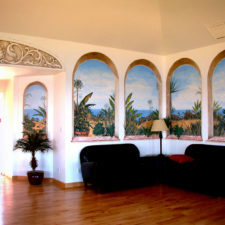 La Jollans were urged to “put forth an effort” to make the visitor’s stay in La Jolla a pleasant one. The plan, locals were told, was to put two courts on Girard Avenue along with equipment and a caretaker. A membership fee (which to this day remains remarkably inexpensive) was announced as only $1.00 for 3 months and entitled the member to not only play, but bring a guest at no extra charge. The plans using Girard Avenue as our location never materialized, but they would, eventually be moved to Scripps Park. On June 6, 1939 La Jollans were happy to hear that work had begun on Point La Jolla for a new San Diego recreational improvement project. Designed by Master Architect Richard Requa, this would include the construction of a specially designed clubhouse and eight shuffleboard courts overlooking the “bathing cove.” Visitors and locals alike would enjoy “comfortable quarters for those who enjoy chess or checkers” (along with other games like horseshoes) and would feature glass facing the sea and folding doors on the opposite side to be closed in less favorable weather. The clubhouse and courts were to be “operated by a club, with a small membership fee” to cover maintenance. Today, the Club continues to operate in much the same manner. The site chosen was City park land set aside by La Jolla Park developer Frank T. Botsford in 1886 and deeded to the City in 1903. The park was occupied by a variety of buildings and uses, including bathhouses, dance pavilions, and a marine biology laboratory and museum throughout the first quarter of the twentieth century, until the last of the buildings was demolished in 1925. On a grand, sunny Tuesday afternoon, November 21, 1939, the Grand Opening was held of the new Shuffleboard Club building. The director of San Diego City Parks as well as the president of the La Mesa Shuffleboard Club joined La Jolla residents, local officials and members of the newly formed “La Jolla Adult Recreation Center Club” (A.R.C.) which would be in charge of the new facilities. It should be noted that later that same year, the La Jolla Journal (later to merge into today’s La Jolla Light) reported the courts were filled to capacity and “a few enjoyed bridge in the clubhouse, though there will be more of that probably when the weather outdoors is not quite so enticing.” Our future was thus, foretold. Though the world war in Europe was concluded in May of 1945, it wasn’t until September of that same year that the war in the Pacific came to an end. 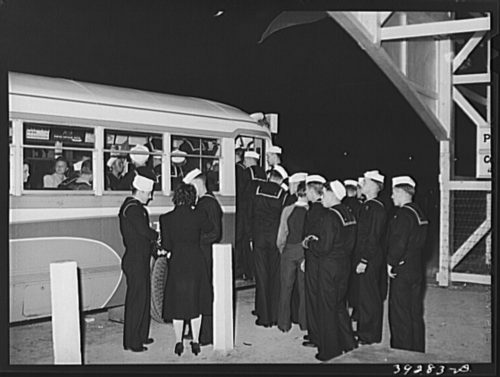 La Jolla attracted many members of the armed forces stationed or visiting our town. Military visitors have been charmed by our town throughout La Jolla history. 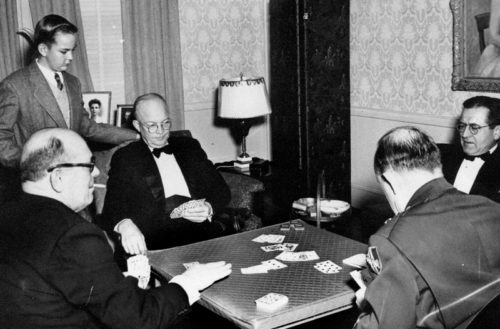 In June of 1945, an article in the La Jolla Journal reported how in its early days, the club house was only lightly used, but that this was no longer the case and that growing interest in playing bridge now had cards rivaling shuffleboard and surpassed other indoor games such as checkers and chess. Along with the enlargement which featured the large glass windows framing the ocean which we love today, new fluorescent lights were installed by the City of San Diego. Members also contributed funds for new vinyl-asbestos floor tile, cards tables and chairs, and draperies which were made by some of the women in the Club. A reconstruction project provided a larger social room with wall-to-wall carpeting, the addition of hot and cold water, a kitchenette, a rest room and a larger storeroom. New draperies and furnishing were purchased by the club. The new building was dedicated in June in the presence of the Mayor and other officials of San Diego and La Jolla. In September, 1968 Mrs. Florence Riford, an active member of the Club, offered funds for the addition of a lounge and small office on the north side. 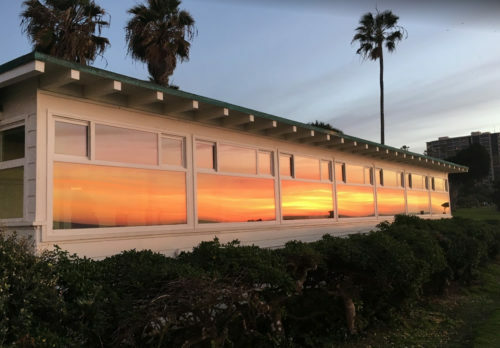 The generous offer was accepted and at the same time the City of San Diego added another rest room, a tool room, room and space for wraps, provided new light fixtures, a ventilating system, a new roof and an enclosing fence. Outside flood lights controlled by a time clock and new plantings completed plans long advocated by the Board of Directors. Dedication ceremonies took place January 16, 1970. In 1998, a plan was presented for removing our old, rather deteriorated, shuffleboard courts and on July 30, 1999, a special golden shovel was used to break ground on a brand-new lawn and garden featuring gorgeous seasonal flowers and attractive landscaping. 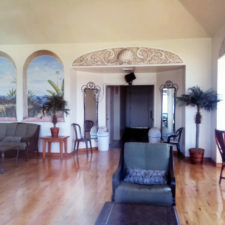 This also expanded our usable area for weddings and other special events. 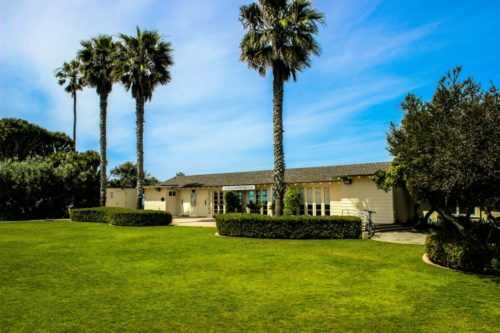 Today, our garden area is one of the most popular features of our lovely grounds and has served as a beautiful backdrop for many outdoor La Jolla weddings along with both social and business events. 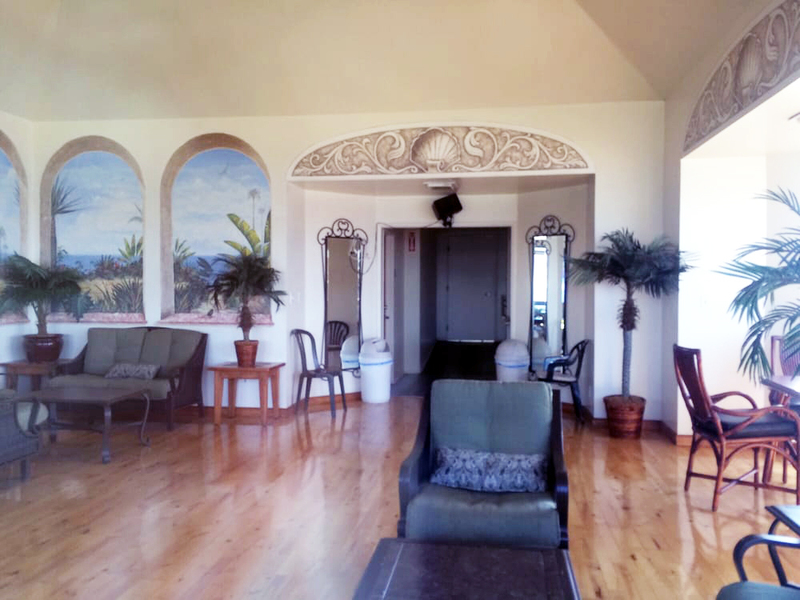 Much character and beauty was added to our clubhouse in 2004 when San Diego artist Rik Erickson was commissioned to add his unique touches. 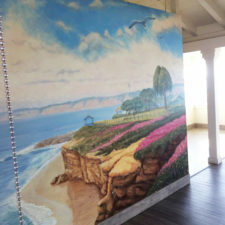 Erickson came to San Diego in 1983 from Chicago and since then, has adorned many buildings and landmarks throughout San Diego with his mural work, faux, fine art reproductions and other art. 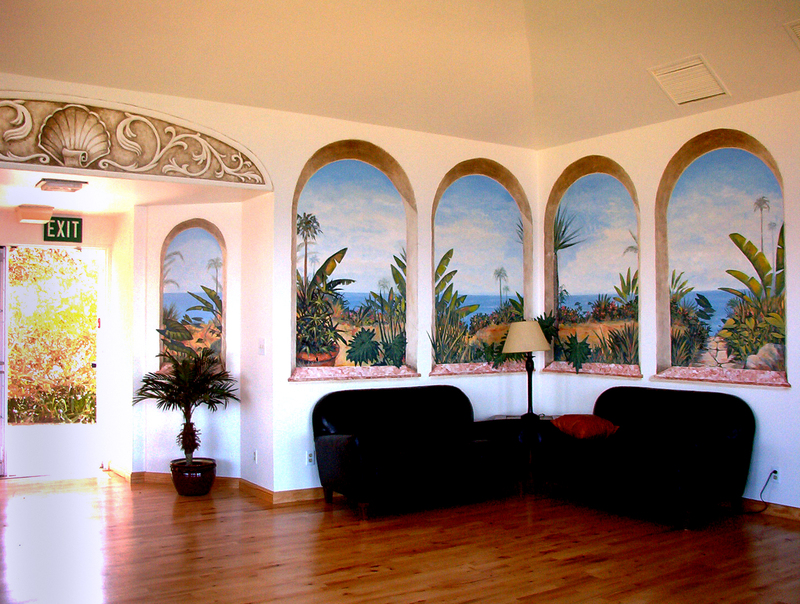 Starting in the main room, Erickson create a “trompe-l’œil” depiction of La Jolla Cove which so pleased our Board that they immediately asked him to come back and add his “Palm Garden by the Sea” to the Riford Room. The artist was given some ideas but was allowed free reign. “They just kind of gave me permission to proceed as I see fit. A lot of times you really can’t picture something until you start,” he explained. “Since they allowed me that freedom, I had nothing to weight me down. 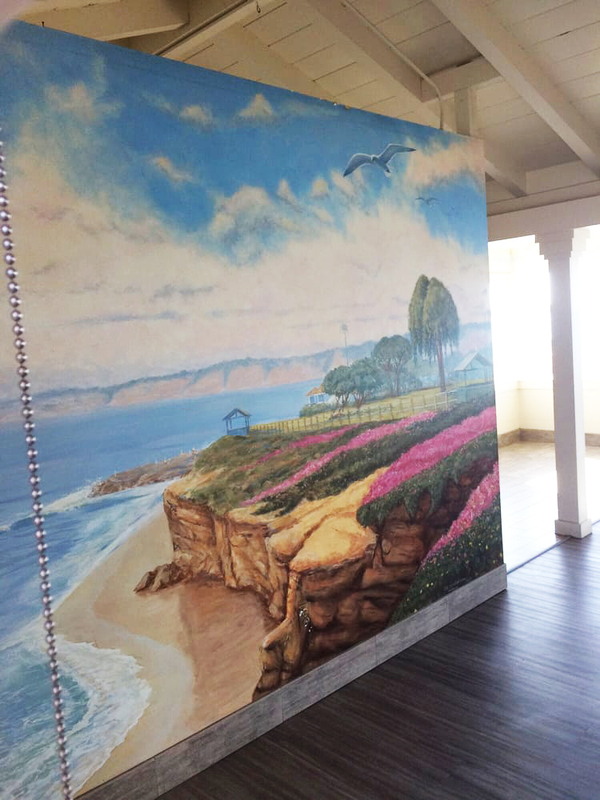 So the creativity just flowed.” The beauty of the location was tremendously inspiring and he remembers his time at the Club fondly as a joyous time being creative in his temporary studio by the Pacific Ocean. On March 12, 2009, the City of San Diego’s Historical Resource Board recognized our historical importance to La Jolla and San Diego at large. We couldn’t be prouder of our heritage. For numerous years, card games were an alternate to shuffleboard, played after a session of the outdoor game or on cold or stormy days. Rubber bridge was the usual game. Early interest in duplicate bridge was expressed by Ann Behrens. It was in 1964, however, that Club President Allan Perkins, having observed the popularity of duplicate bridge while on a trip East, appointed Margaret Macurda to start duplicate bridge as an activity at the La Jolla Shuffleboard Club. Coming at a time when membership and finances were at a low ebb, it was an almost instant success and continues to be a popular diversion. For a small fee, members and non-members may play under the guidance of a professional director. 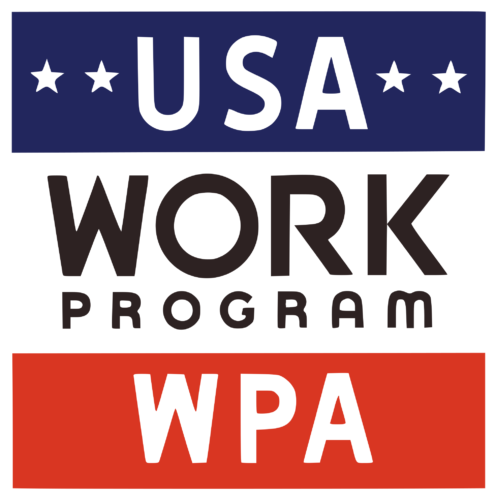 Players may select their own partners or may obtain one by telephoning a member of the Committee. Although game days and times may change, this tradition of duplicate bridge continues to this day. Visit our Games Page for current information of games schedule, fees, etc.